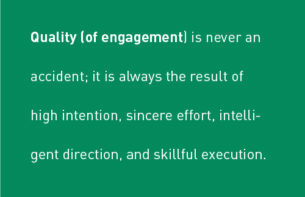 Quality (of engagement) is never an accident; it is always the result of high intention, sincere effort, intelligent direction, and skillful execution. Winter conference meeting and trade-show season is coming to an end. This year, I had the chance to attend several ag events – all with a trade-show of some kind available for producers to learn more about ag industry clients’ technologies, services, and product offerings. My observation: quality of engagement was shallow, and return on time and investment was most likely poor for many trade show sponsors, exhibitors, and attendees. Throughout my long career in ag, I’ve attended more informational/educational events than I can count, and have seen the ups and downs that largely coincide with our industry’s cycles. I also recognize the investment, not just in pre-event PR and exhibitor/sponsor cost, but also the human capital expense that is associated with the decision to be involved in trade shows, and how difficult that investment, and associated return on that investment, is to measure. Over the past several months, more than before, the investment for many organizations appeared to be high, yet the traffic through booths was low – and engagement with producers not very in-depth. I observed that overall enthusiasm and purpose from many exhibitors was lacking. This brings me to my question. What is your plan for the fall season? How will you become much more intentional with your tradeshow and producer engagement dollars? How will your tradeshow strategy be a part of the overall go-to-market and relationship-building strategy you have with your customers? How can the quality of engagement advance your value proposition? And of course, how will you measure success? Tactically, how are you preparing those staffing the shows? How will you drive qualified customers to your exhibit and what are your next steps if they are there? An intentional plan, skillfully executed, will drive relevant and high quality engagement; it will drive success. Based on my observations this year, I question the future of agricultural industry trade shows as an effective way for companies to engage their ag professional audience unless organizations become much more intentional. This intentional plan needs to consider the engagement strategy (pre, during and post event) and content strategy (what discussion of value are we having?). Beck Ag has spent the past 20 years engaging producers with relevant content of value and helping organizations think differently, and intentionally, about their go-to-market strategies. 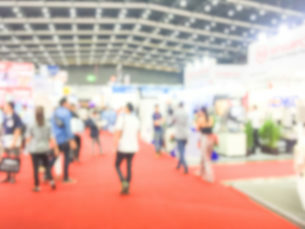 As tradeshows hit the “reset” button prior to late summer, there are some simple areas we can help organizations to be more intentional and deliver a quality experience for customers, and more importantly increase the likelihood of success and raise the ROI of the event. Let me know if you agree with my thoughts and share your experiences.